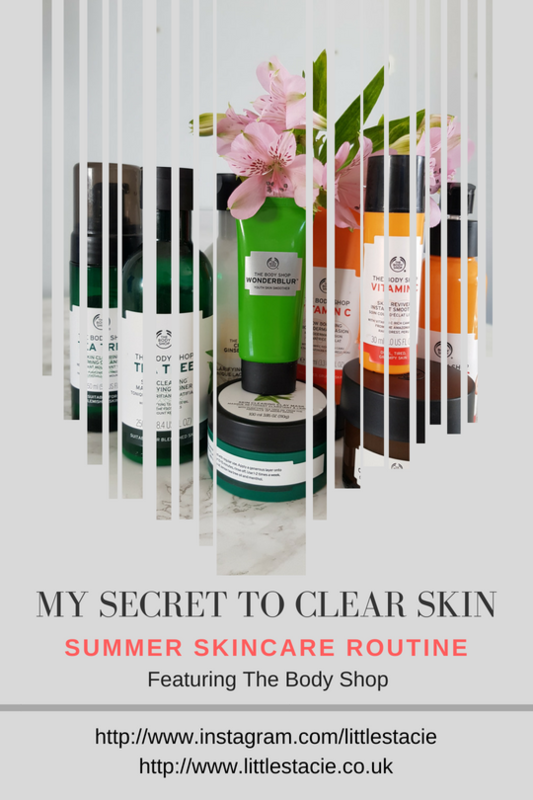 It's been a while since I shared my skincare routine with you, and with it being summer my skin is usually at it's worst so here are the products saving my skin right now! 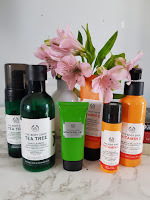 I have been obsessing with The Body Shop products for a while and I've fallen in love with their varied range. The difference in my skin is incredible and I couldn't be happier, I have accepted that I will never be blessed with flawless, clear skin, but this is certainly the closest I've got. I have added my weekly alternates in as well because a few of the products I like to switch up in the week just to add different ingredients! Before I start my routine I usually have a Bath/Shower just to open up my pores so the products can really sink in and I get the best results! 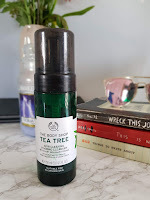 I begin with using Tea Tree Skin Clearing Foaming Cleanser from TBS, I had never used a foam based cleanser before and honestly I don't think I will ever change now, it's so light on the skin, a little really does go far and my make-up is off in seconds. 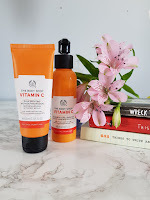 Next I use either TBS Vitamin C Glow Boosting Microdermabrasion or TBS Vitamin C Glow-Revealing Liquid Peel - I'm obsessed with both. When I need a heavy scrub I will use the exfoliator and then in between I will use the Liquid Peel. 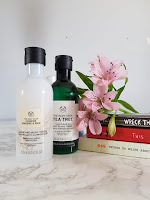 They are both incredible products especially the Liquid Peel which is in high demand at the moment, it leaves your skin feeling fresh, brand new and glowing. 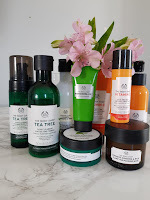 I then go ahead and use a face mask (only twice weekly) at the moment I am using TBS Skin Clearing Clay Mask and Chinese Ginseng & Rice Clarifying Polishing Mask. These products have really improved my break outs but also haven't been too harsh on my skin in the process. For anyone who suffers with acne/breakouts they really are game changers. I leave my face masks on between 10-20 minutes depending on the severity of my acne. Now to tone my skin, I alternate between two of TBS toners, the first is Tea Tree Skin Clearing Mattifying Toner and the other is Chinese Ginseng & Rice Clarifying Milky Toner, I tend to use the Tea Tree toner more regularly when I'm having break outs and the Milky toner when my skin is clear. I love them both equally as they are very light on the skin and super refreshing. 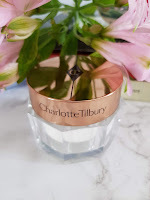 Second to last is my moisturiser, my favourite at the moment is Charlotte Tilbury's Magic Cream, which comes in a day and night version. 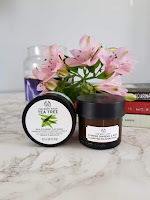 The day cream is light, and leaves you with a beautiful glow, whereas the night cream is a little heavier on the skin, however it's incredibly hydrating and perfect for the treatment your skin needs overnight. 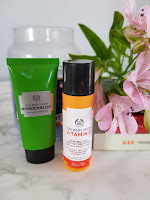 Finally, to finish off my routine I use either TBS Vitamin C Skin Reviver/Instant Smoother or TBS Wonderblur, they are both perfect to use if you want a matte finish, and work as perfect primers as well as being additional vitamin boosters for your skin. They are by far my favourite skincare products and give my make-up a flawless base to work with! And there we have it, this lengthy routine isn't for everyone, however for my skin to be clear and glowing this is the extent I have to go through and it's worth taking 30 minutes out of my day to do it. My skin has improved majorly and I couldn't be happier with the results!